I have owned the 2017 Mirage for a week now. The day after we bought the car, it snowed like crazy, warmed up, re-froze, and snowed again and the temps have been in the teens last 3 days here in the snow belt in NE Ohio. We have had no issues starting the car in sub-freezing or single digit temps. 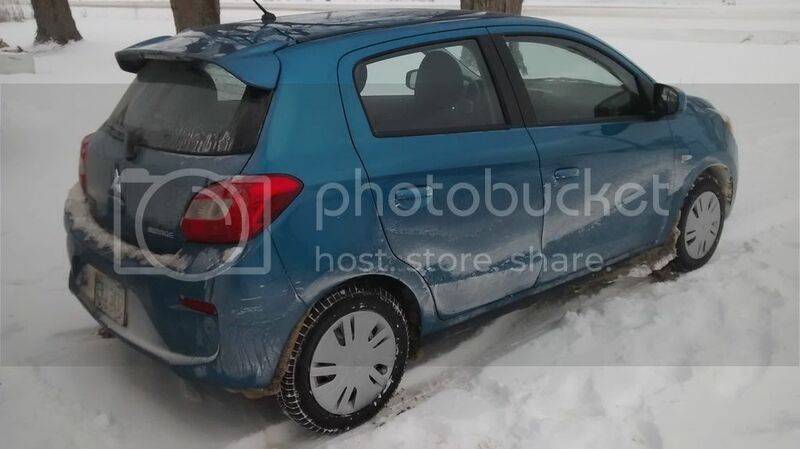 This Mirage has the stock all-season tires on it and we have had no issues driving on the snow covered roads. One morning we were pushing snow with the front bumper and the car did outstanding. Since I just got the car Monday I did not have a chance to get it rust treated, but it will get done soon. I have a 96 Metro that was rust free and we drove it 2 winters before storing it the last 3 winters, but it's been rust treated (oil/mineral spirits) annually since we got it. The traction control came on once when trying to get out of the very end of the driveway where the snow plow buried the entrance. During normal driving the traction light never came on. We can drive safely on snow packed roads 40- 45 MPH and the car stops well in the snow. So well our anti-lock brakes have yet to activate. The heater in the car keeps the cabin very warm. Warm-up times from dead cold are very short and heat seems to start coming from the vents very quickly. If traveling more then 10 miles or so, you may even need to turn the heater controls down some, so no complaints there. Very happy with our purchase of this car! Hey Johnny, cvt or 5mt? Just got a 17 ES 5mt and it survived the 1st storm yesterday. We have a 15 ES CVT with Michelin X tires and it does great in the snow. Got the 5-speed of course. Actual snow tires would make the car even better. I have had my '17 G4 with CVT for a month and through a couple moderate snows. No problems and the traction never came on, even on some icy spots. I have to agree the heater/defrost works great, even better than my old Buick that took forever to get warm. I use the fog lights frequently since they light up the edges of the road, but have not used them in heavy snow. I love that the Mirage, even the sedan, has great visibility, important in city driving and in storms of any kind! Here they are today in the foot of snow we got last night. 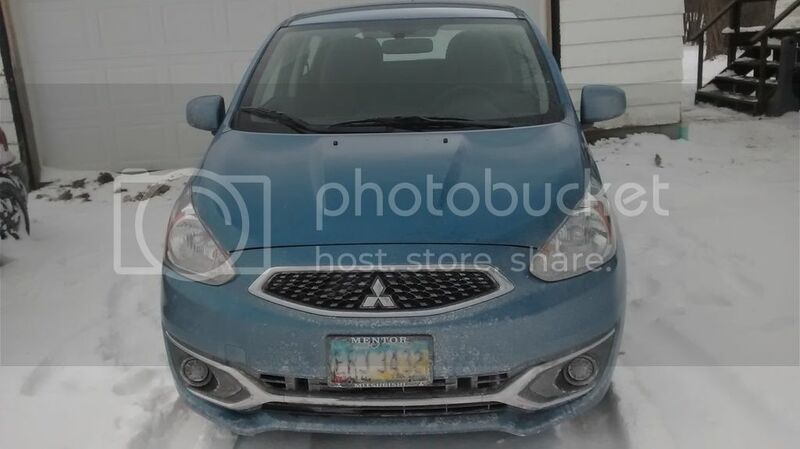 The Mirage has three electric PTC heaters to help heat the cabin until the coolant warms up. Snow tires work wonders on these cars. I have Pirelli SnowControl 3s on mine right now, and in the 6" or so of snow we got here about a month ago (snow is rare here in the Seattle area) the car did very well. Only had the ABS and traction control activate a couple times, and that is after the snow had changed to black ice. If you like the heater, wait six months when it is 105 and you can hit the AC! This is my third winter driving with my Mirage. Here in Rochester NY we get tons of snow from the Great Lakes. The first couple of winters were fine, but this one I notice that the car tends to slide during noticeably softer maneuvers. It must because the tires treads are also noticeably shallower. The ASC has already come up to shorten a few fun slides, like this brief one. You can hear the ABS activate to stop the slide. Egg, seen you mention this before. Where are they located and when doo they turn on? Any other info? Maybe This explains why some people think the heats "omg so great" and others think it's nothing special? 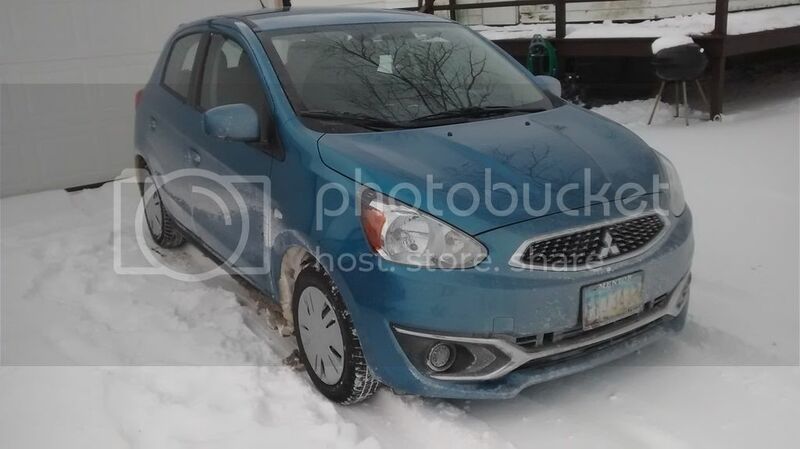 Did you fill the tank with 20/10 or some other de-icer, or did you just assume Mitsubishi would do it for you when they brought the car over from THE TROPICS?? It may be 11 degrees in Boston, but it's 81 degrees in Phuket. Last edited by MightyMirageMpg; 01-09-2017 at 01:11 PM. The PTC heaters are behind the glove box somewhere around the heater. I'll try to get pictures of it when things warm up. I think it comes with auto climate controls. I had hoped to find its operating parameters spelled out in the service manual, but couldn't find it.